Eli Manning and the New York Giants will square off with Robert Griffin III and the Washington Redskins in the first game on the NFL Confidence Pool Week 4 sheet. The division showdown just one of the many games on the NFL Confidence Pool Week 4 sheet. 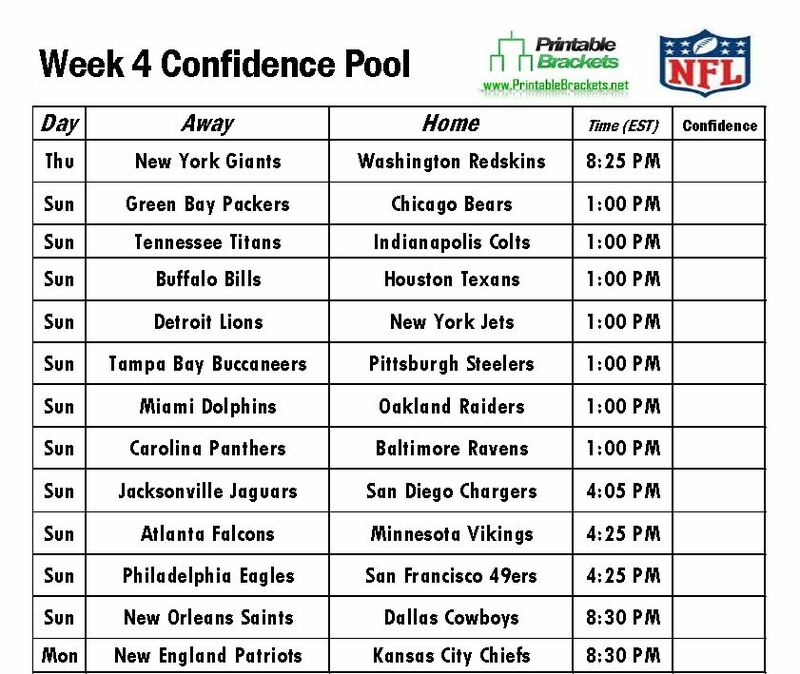 You can download and print the NFL Confidence Pool Week 4 sheet absolutely free. You can also get a standard Week 4 Pick Em sheet at no charge here at PrintableBrackets.net. The Giants and Redskins are both looking to bounce back after disappointing 2013 seasons. The Giants dropped their first six games to open the season before rallying to finish the year 7-9. Constant turmoil besieged the Redskins and led to the firing of head coach Mike Shanahan after a 3-13 season. The Giants swept both meetings with the Redskins in 2013. After pulling out a 24-17 road victory in Week 13, the Giants ended the year with a 20-6 win in Week 17. Meanwhile, the Green Bay Packers and Chicago Bears will renew their long rivalry in early action on Sunday. In other early Sunday action, the the Baltimore Ravens will host the Carolina Panthers, the Indianapolis Colts will welcome the Tennessee Titans, while the Detroit Lions will be on the road to face the New York Jets. In late action on the NFL Confidence Pool Week 4 sheet on Sunday, the San Francisco 49ers will play host to the Philadelphia Eagles, while the San Diego Chargers clash with the Jacksonville Jaguars. Meantime, the Cincinnati Bengals, Cleveland Browns, Denver Broncos, St. Louis Rams, Arizona Cardinals and Seattle Seahawks will be the first teams to have their bye week in Week 4.